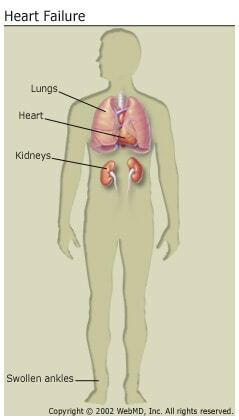 Heart failure is a condition in which the heart can't pump blood effectively to the lungs or the rest of the body. This can be because the person has developed a weakened heart muscle or because the heart muscle has thickened or stiffened, making it difficult to fill the heart and backing up blood into the lungs. With heart failure, the weakened heart pumps less blood than usual, causing the kidneys and adrenal glands to produce chemicals that help the body to hold onto salt and water. In addition, the blood vessels constrict, raising blood pressure. This makes it even harder for the heart to push blood through the arteries. Because the body is retaining salt and water or the heart is unable to pump blood forward, water may pool in the legs and ankles, causing them to swell. Fluid may also collect in the lungs and interfere with the ability to breathe, especially when lying down. Left untreated, heart failure worsens and may prevent the heart from pumping enough blood to keep the person alive. Class I: Physical activity is unaffected, and the patient has no unusual fatigue, shortness of breath, palpitations, or pain during normal activities. Class II: Slight limitations on normal activities. The patient may experience mild fatigue, shortness of breath, palpitations, or pain during normal activities; no symptoms at rest. Class III: Marked limitation on normal activities. The patient experiences fatigue, shortness of breath, palpitations, or pain during less than normal activities; no symptoms at rest. Class IV: The patient is uncomfortable even at rest. Discomfort increases with any physical activity. Doctors also classify heart failure according to whether it is primarily a problem of pumping the blood out of the heart due to a weakened heart muscle, or if the patient has problems primarily with filling the heart due to a stiff heart muscle (also called heart failure with normal ejection fraction). Heart failure with normal ejection fraction now accounts for almost half of the heart failure seen in the U.S. and is the dominant type of heart failure seen in the elderly. About 5.8 million Americans have heart failure, which contributes to about 282,000 deaths each year. Although treatment of heart failure has led to improved survival rates, as many as ten percent of patients with mild heart failure and more than 50% of patients with more severe heart failure die annually. Heart failure is the single most frequent cause of hospitalization for Americans ages 65 and older. 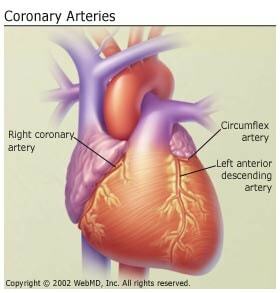 Many people with heart failure have both coronary artery disease and hypertension. Silver, W., ''Success With Heart Failure: Help and Hope for Those with Congestive Heart Failure,'' HarperCollins, 3rd edition October 16, 2002.